With a little extra time on my hands after installing my exhibition in Athis de L’Orne, France this summer I was able to tool around the under-traveled, inland, and completely charming Basse Normandie region. I know I’m not the only one with the strategy of traveling the back roads if you want to increase your chances of stumbling upon interesting oddities. This post confirms the wisdom of the circuitous meander. My hostess and co-director of ArtTerritoire, Domique Delomez, called this my “butterfly map”. Butterflies! I like that: a far more poetic description of the post-its I stick on my road map to mark stop-worthy curiosities. My hosts recommended the addition of a new butterfly to my map: a magical, microscopic chapel tucked in the woods: the Ste. Genevieve Chapel. They didn’t say why I would like it but they felt certain I would. So off we went, choosing our route by following our “butterfly” landings. Turns out La Sauvagère hosts a chain saw carving contest every year. Nice! Won’t be long til there’s as many chainsaw sculptures as flower pots. Then La Sauvagère can be re-designated as “Village Sculptée”. Tucked away on the back side of La Sauvagère lies another treasure–a lovely roadside grotto. Those of you who are followers of my blog will know that I’m a fan of this curious genre of roadside art. Onward on the twisty turny roads we travel, hoping to find the neolithic dolmen “La Table au Diable” that is marked with a little symbol on our Michelin map. After taking this wrong turn and that wrong turn and traversing a couple fields twice over we found this awesome 5,000 year old burial chamber! As enigmatic as the “Table de Diable” is so too is the La Tour de Bonvouloir. 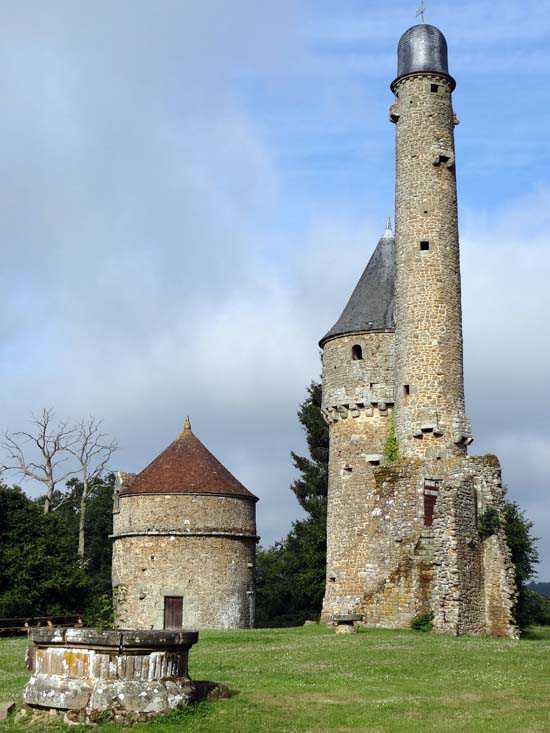 A cryptic reference in a tourist pamphlet to the phallic nature of this 15th century tower was enough to get us to drive the winding road to the community of Juvuigny-sur-Andaine. Legend has it that the 15th century Lord Hugues was forced to abandon his ancient, exhausted horse at this spot in the forest. When Hugues returned the next day he found his steed, who had quenched his thirst in the nearby spring, completely recovered. Intrigued by his stallion’s miraculous transformation, Lord Hugues jumped into the spring . He, too, emerged astoundingly rejuvenated. Feeling his oats, off he went to present himself to the Lady of Bonvouloir. (Translate: Lady of “Goodwill” !) She accepted his hand and together they produced a large and handsome crop of offspring. Lord Hugues left his mark on the land by erecting la Tour de Bonvouloir , a symbol of his potency. Oy! We thought we’d have La Tour de Bonvouloir to ourselves , but to our surprise and delight we found the grounds around the phallic tower hopping with dancers in a lively celebration of Norman culture. We could see on our map that our ultimate destination, La Chapelle de Ste Geneviève was less than a kilometer away if one dared to cut through the woods, but we couldn’t risk bush whacking at sunset, so we climbed back in the car to continue our circuitous route. In the middle of a peaceful stretch of forest a teeny weeny chapel emerged by the side of the road. The little structure looked more like a gnome’s home than a chapel, with impish carvings all around. I wanted to slip inside this magical little space, but the door was locked tight so I had to content myself with peering through the grill. 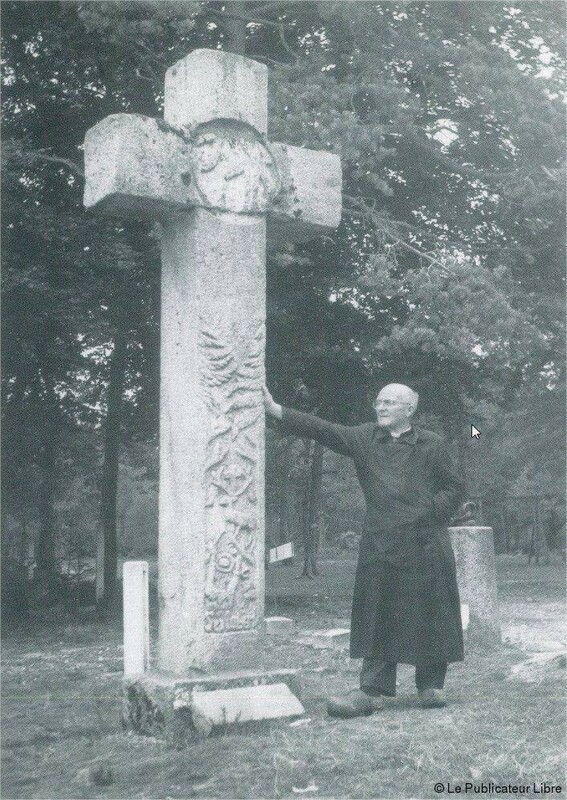 Here is Abbot Honoré Derouet the last pastor of the nearby St Front church, who took it upon himself to restore this 1856 chapel which had been toppled by a tornado in 1923. Derouet carefully cobbled together the original stone blocks, added his own carvings outside and in, and dedicated the chapel to “his” saint, Ste. Geneviève, the patron saint of peace– an apt choice for the Abbot who had spent a few miserable years as prisoner of war in Germany during WWII. To keep himself sane in prison, Derouet took up carving, sculpting whatever bits of wood he could lay his hands on. In his life time Derouet carved over twenty calvaries. He joked he would present these sculptures at the gates of heaven and demand entry. Abbot Derouet dreamed of making the Chapelle Ste Geneviève a serene gathering place for his fellow prisoners of war as well as a tourist destination. To this end he cleared the trees in front of the chapel to expose a beautiful view of the countryside and added carved benches, tables, and sculptures. He even added a restaurant, creperie, and children’s amusements. This old postcard shows that the site was once indeed a popular attraction. 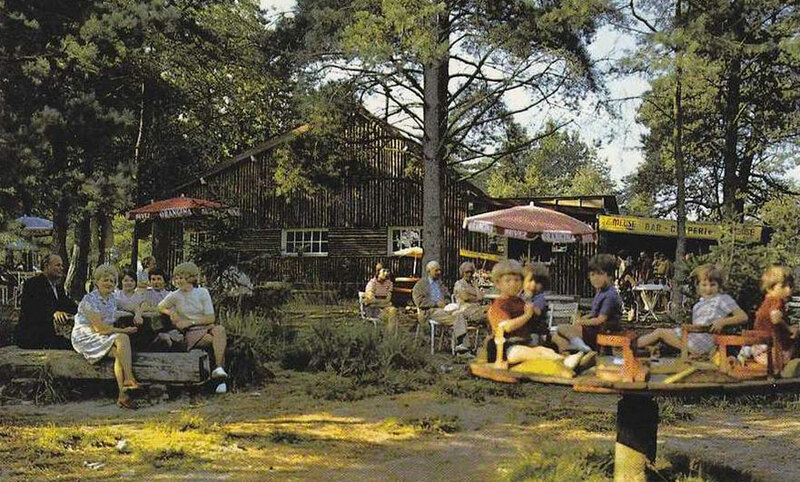 Today the restaurant and creperie have disappeared, the forest has grown back up, the vista has been obscured, but the magic and peacefulness of the place that Abbot Derouet created remains. In the last hour of sunlight we hop back in the car deciding it’s time to point ourselves back to a Michelin “red” route to make a speedier return. But then, just as we turn the last bend of our “yellow” road, Surprise! Up pops this friendly face to bid us bonjour and adieu. We look on the map. Ha! We find our new green friend lives in the speck of a village named “Etoile”– “Star” in English. And indeed, he is the star of our back roads day.